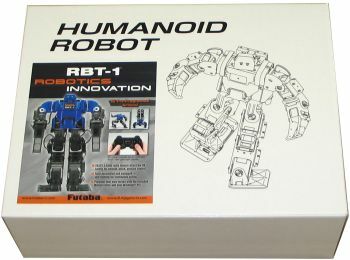 Futaba RBT-1 Humanoid Robot Unboxing Extravaganza! 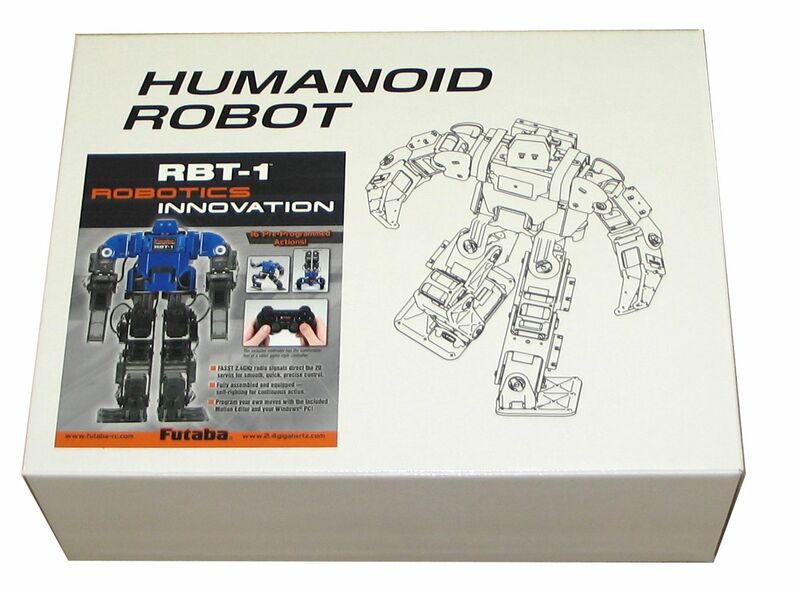 A few months ago, I announced the impending arrival of Futaba’s RBT-1 humanoid. Well, today I’m very pleased to tell you that it’s here! It’s in our shop, right in front of me, glaring menacingly with its glowing green eyes while it practices its Robo-Fu. So without further ado, here it is: the Futaba RBT-1 Unboxing Extravaganza! There it is. Boxy goodness. Click for big. Ok, now let’s talk about the goods. 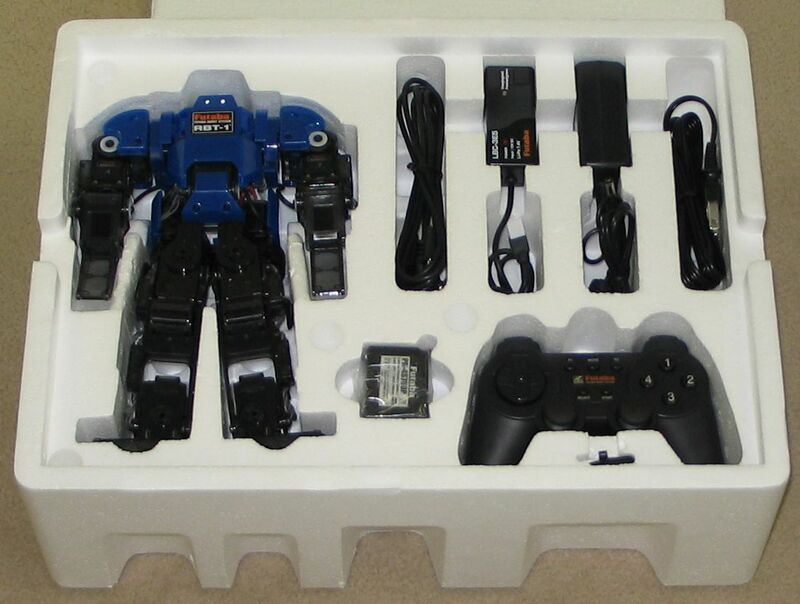 Taking a look at the picture above, we see the following items: the CD, some docs, the mighty RBT-1, serial cable, Li-Ion charger, AC adapter for charger, AC power cord for AC adapter, a Playstation-style controller, a nice little 7.4V 780mAh Li-Ion battery, and a tiny screwdriver. Now to assault you with information. 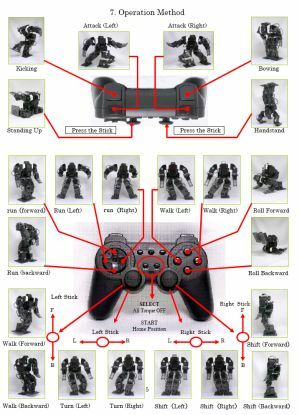 The Bot, At a Glance. The RBT-1 from Futaba is slick, compact, and flexible. It stands just under 10 inches tall, yet still possesses 20 servos. The servos are small, but they are very quick and have an impressive turning range. They are serially controlled, with multi-port serial bus modules mounted on various parts of the robot, to split the signal off to the various actuators. The electronics are mostly inaccessible. I know there’s a tilt sensor in there somewhere, but it seems like it doesn’t really affect the pre-programmed motions, except to let the bot know that it’s lying on its back. This is something that will have to be explored further. Not quite popping and locking, but close. As usual, click for high-res. 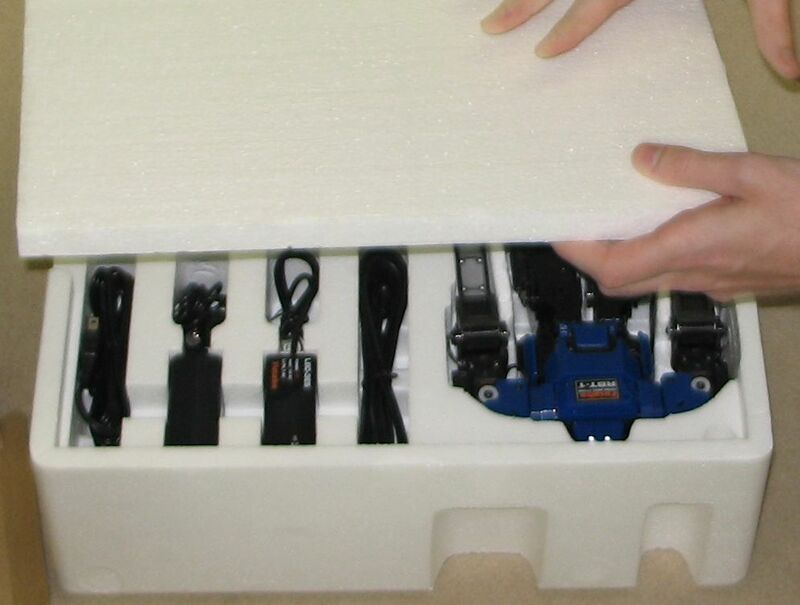 The chassis and joints have a notable feature as well. The servo horns are not rigidly attached to the frame pieces, as is the case with all of the other humanoid robots I’ve handled. Instead, the horn has a ring of knobs around its perimeter, which match to a ring of holes in the frame piece that it attaches to. What this amounts to is a a kind of clutch mechanism. If the joint is overstressed, the clutch will pop into a new position. This acts as a shock-absorbing system. If the bot takes a spill that would normally crack a bracket or strip a gear, the clutch kicks in and allows the joint to turn without damaging anything. Then it’s a simple matter of manually rotating the joint back into place. Sure, this could be seen as a weakness in high-impact combat situations, but I have the feeling that it will actually make the robot more durable in the long run, making up for the plastic brackets (which purists will inevitably complain about). 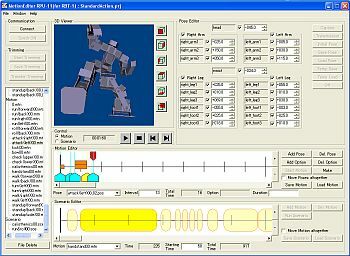 Motion Editor. Pretty! Clicking graphic gets you bonus points for extra bigness. I only got to mess around with this for a few minutes, but I must say I’m quite impressed. You can load up the canned motions and edit them, or start from scratch. Like many motion sequencing programs out there, it consists of picking joint positions, then defining transitions between them. There is a time line for organizing the steps in a particular motion, and also a “Scenario” timeline for stringing a sequence of motions together. Servo positions can be set in a number of ways. You can enter the angle in a text box or use arrows to increment/decrement said number. Also, and this is the fun way, you can just click on a joint in the nifty 3D view and swing the mouse around to reposition it. Moving Pictures, Served Up Hot and Delicious. Here’s a shot of me messing with the clutch-joints. They can be moved, but not that easily. Oh, and did I mention we’re selling this thing? Well, WE ARE! 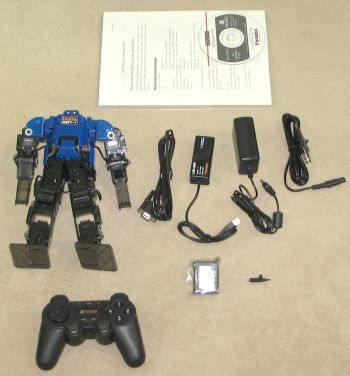 Click here to purchase the Futaba RBT-1 Humanoid Robot. You’ll find more technical specs on the product page.